Twilight photographs are some of my favorite photos to create. It takes a lot of my landscape knowledge and applies it to architecture photography. When shooting landscape during a sunset or even under the Milky Way you are constantly capturing the environment in all types of light. These type of photographs have both an artistic and functional aspect. By combining multiple photographs throughout sunset and blue hour I can capture the different stages of light on the home. I then "enhance" the light that is already there by using a GL-1 Hotlight and painting it on the scene as if the house lights are spilling out onto the landscape. 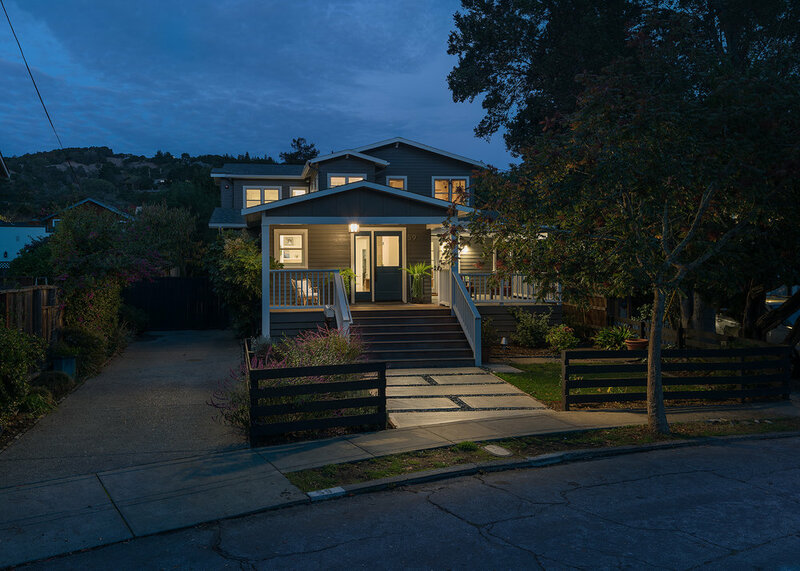 The image above is from a recent shoot with Richardson Architects based in Mill Valley, CA. Some challenges we faced while scouting our night shot was that the tree in the front yard was blocking most of the home. A one point perspective was out of the question for this reason. Moving to the left fixed this issue but there was just too much driveway in the frame. Since the second story was set back many of the views from the street were too low. As we moved back to the other side of the street we could begin to see the entire home. I set the camera on the tripod and extended up about 2-3 feet above my head and saw this was going to be our composition. Since I don't own a tripod this tall I moved my Jeep over and placed it on the hood (see photo below). As sunset approached I began shooting multiple exposures until it got completely dark. I use an iPad connected through wifi on the camera to trigger the shutter remotely. This gives me the freedom to walk around with my GL-1 Hotlight and "paint" light into the scene where I think it works best. The series of images below are the culmination of shots taken that night. I then layered all these in photoshop to create the final image. This is the base image I worked from. I exposed for the lights on the interior and built from there. Here I have applied the 10 or so light painted layers to create the feeling that the house lights are spilling out onto the landscape. Here I have made color and exposure adjustments to bring out the sky and surrounding landscape. The road was a mess of cracks and patches. I decided to spend the extra time and clone them out. I also replaced the grass between the sidewalk and street as it was patchy and distracting. Here is the final image after some more color correction and exposure adjustments. More cloning was done to remove the houses on the left and the car in the neighbors driveway.